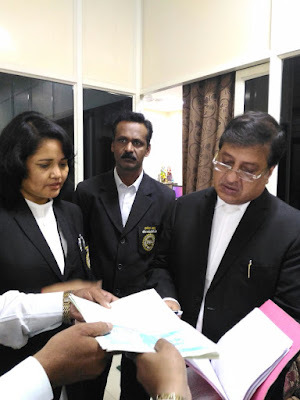 The District Bar Association submitted a complaint letter against the illegal notaries being prepared by stamp vendors in different parts of the city to the District and Session Court Judge DJ Shailendra Shukla, demanding action against them, on Friday. The letter was submitted under the leadership of Advocate Sapna Chawdhury, Vice President District Bar Association, Bhopal. “There are only 68 authorized notary advocates across the city. However, presently, more than 1000 stamp vendors are operational across the state capital preparing notaries for the people. The stamp vendors are authorized only to give stamps only. However they are illegally using the notaries and seals. On behalf of the notaries, they are using stamps and signatures which they are not authorized to use," Sapna Chawdhury, said. "Around three months ago notary advocates had written to the President of the District bar Association in this regards. I was then appointed as the coordinator. We subsequently forwarded the complaints to the Collector, SP, SSP, IG and the ministry, but in vain," she added. The DJ has given an assurance that a probe committee will be formed to look into this matter and action would be taken against illegal stamp vendors.